Underground Research Initiative: Character Interaction Beat Breakdown of Star Trek TOS Episode S2E10 "Journey to Babel"
Character Interaction Beat Breakdown of Star Trek TOS Episode S2E10 "Journey to Babel"
Robert McKee, author of Story, a scriptwriting and storytelling guide, offers a teardown mechanism for understanding story structure in Chapter 11, "Scene Analysis." 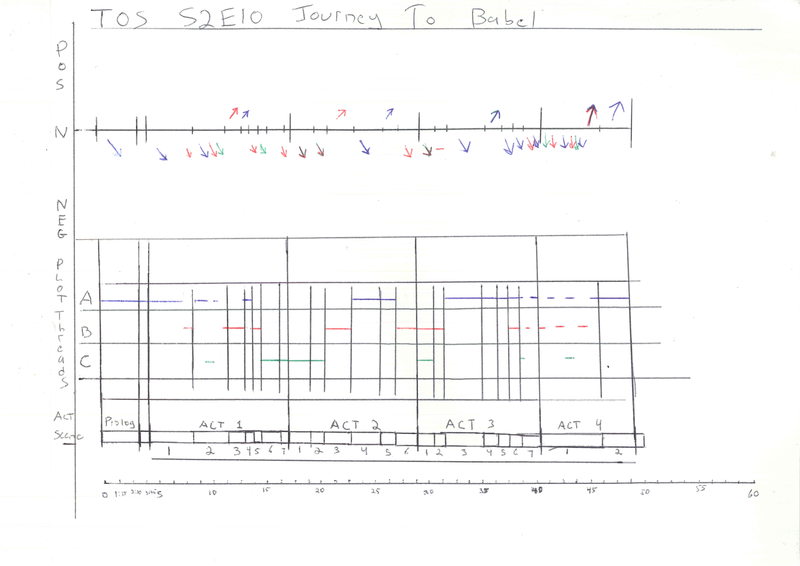 This post uses the techniques and terminology he presents to deconstruct the Star Trek Original Series episode, Journey to Babel. Written by D.C. Fontana, it tells the story of a familial breach between Spock and his father, Vulcan Ambassador Sarek. On mission, the Enterprise is host to a group of diplomats who board to travel to a diplomatic conference. During transit, a spy intervenes and threatens the mission, while Amanda, Spock's mother and Sarek's wife, Kirk, and others attempt to resolve the family breach between father and son. The McKee approach avoids plot - or event - analysis and instead focuses on a beat based text / subtext analysis of character interactions. The purpose of this is to tease out subtext implied by dialog and thereby determine underlying character motivation. Further, it breaks down per-scene opening and closing values, or emotional states imparted on the audience implied by story events. Next, the goal is to find plot thread structure embedded within scenes, sequences, acts, and the entire story - that is, interleaving of plot structure as A, B, and C plots intertwine. The last task is to determining a controlling idea - or, theme. 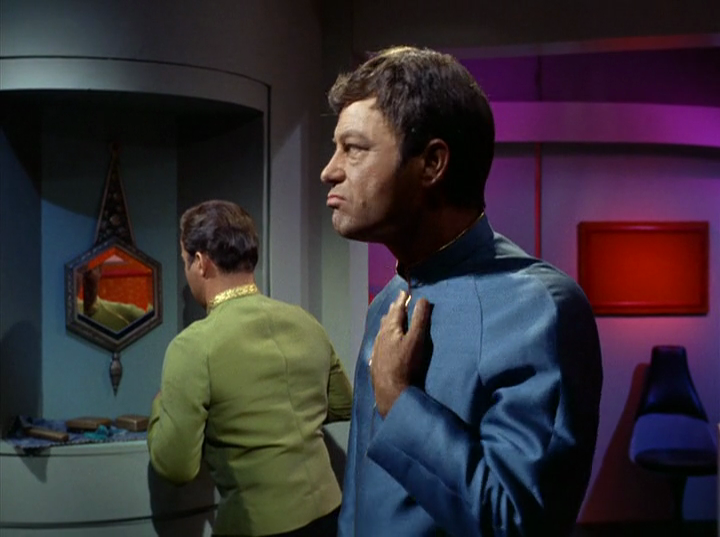 In the PROLOG, the story opens the A PLOT, with McCoy in Kirk's quarters expressing discomfort to Kirk at being forced to wear formal regalia for a diplomatic function. But soon the focus transitions from McCoy and Kirk to Spock and the Vulcan diplomat Sarek. Immediately, it becomes clear that Spock and Sarek know one another and that Sarek dislikes Spock. Kirk offers Spock to Sarek as tour guide for the Enterprise. 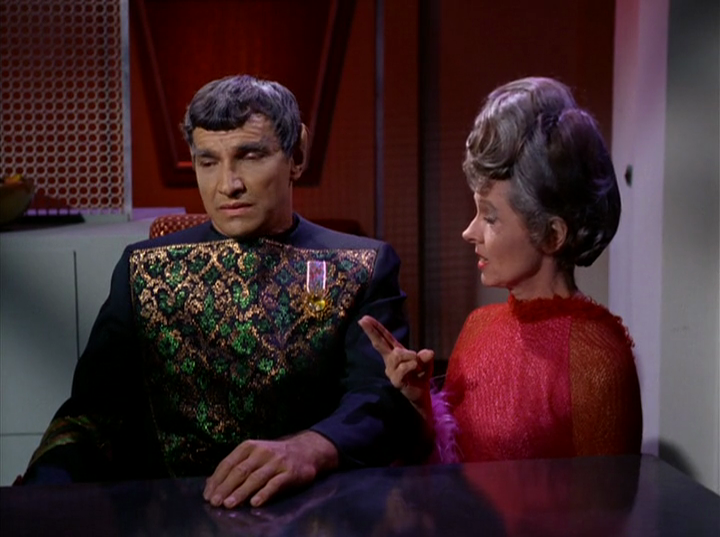 But Sarek openly refuses to recognize him and requests an alternate guide. It becomes apparent that Spock is persona non grata to the man. Moving to Scene 2, the A PLOT continues then transitions to open a C PLOT about a diplomatic conflict over the incorporation of a planet into the Federation. 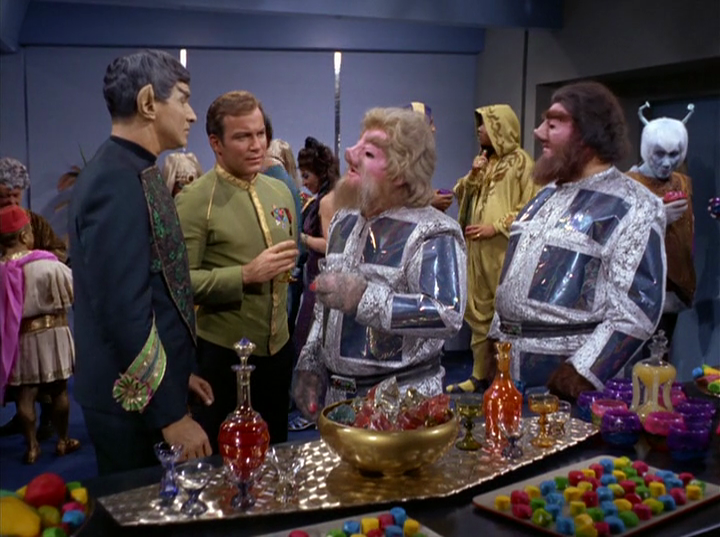 Sarek and Tellorite Ambassador Gav have a verbal confrontation with Sarek refusing to answer Gav's questions. With all three plot threads now introduced, there's a turnaround back to A PLOT and then Scene 2 finishes off with B PLOT as Chekov contacts Kirk over the ship intercom about a MYSTERY SHIP tailing the Enterprise. This is the only scene in Act 1 with multiple plot threads, and it's worth noting that with all players from each plot are present in the reception room, making intercutting shots from distant sets where differing plot events might take place unnecessary. 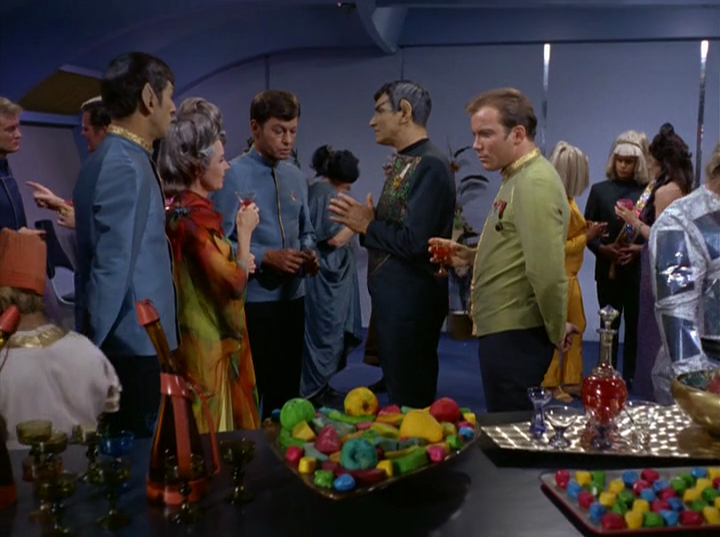 Transitioning across plots is handled by Kirk leading Sarek off from one group, McCoy, Spock and Amanda in A PLOT, to another group, Gav and the Andorian diplomat for C PLOT within the same room. Thus creating what McKee terms French Scenes (Story, Pg. 292), or a breakdown of the scene into separate subscenes based on changing location and groups of characters within the same set location. 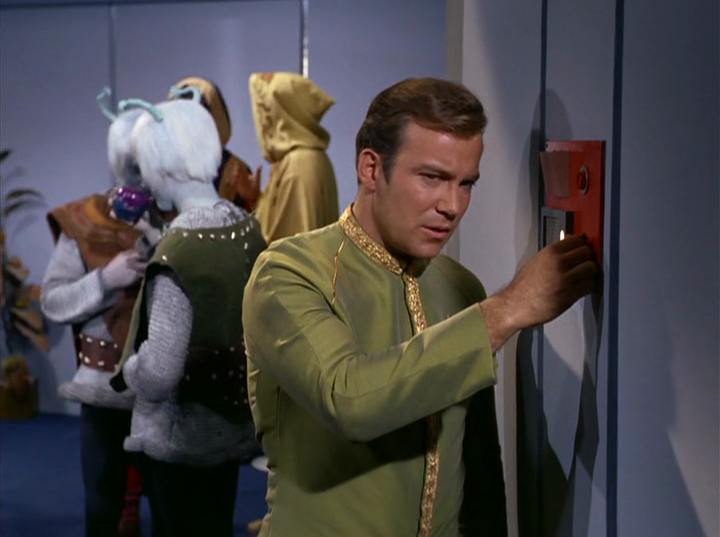 Kirk repeats this at the end of Scene 2 when he is called to a wall intercom by Chekhov, separating himself from both groups to transition the subscene to B PLOT by nature of communication with a character off set via a wall intercom. What's curious about this is that it perfectly fits Christopher Booker's RULE OF THREE thesis, found in Seven Basic Plots (See pg. 229). Thus, we have three examples of problem escalations across each of the three A, B, and C plots leading to a major TURNAROUND and CLIFFHANGER at the end of ACT 1. As Booker argues, three leads to four, or three examples of a first state leads to a transformation in the fourth example to a second changed state. By the start of ACT 2, the C PLOT continues for two additional scenes. There, an investigation of Gav's murder leads to Sarek as PRIME SUSPECT. 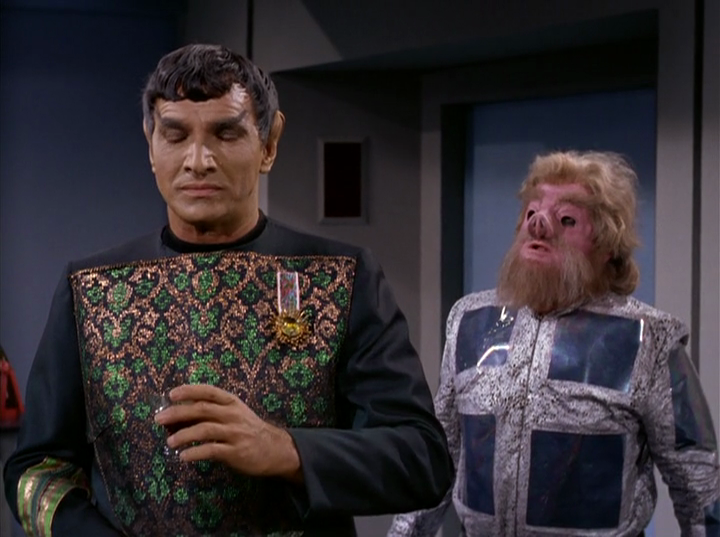 But, Sarek collapses during questioning, showing him to be gravely ill with HEART TROUBLE. This can be interpreted at two levels. First, in the text, as a reason why the character cannot be viable murder suspect - he is too ill. But, secondly, at a subtext level, it can also be interpreted metaphorically. Spock's estranged father has a BROKEN HEART. Thus, resolving this FAMILY BREACH must also resolve his HEART TROUBLE. B PLOT then intervenes in Scene 3, as an EXTERNAL THREAT from MYSTERY SHIP ramps up suspense. Finally, Spock and McCoy determine just how severe Sarek's LIFE THREATENING CONDITION is across Scenes 4 and 5, with both agreeing to Amanda's dismay that PATERNAL DEATH will be the likely outcome. Yet, through hard INVESTIGATIVE WORK, Spock offers a TECHNICAL ALTERNATIVE to McCoy that might SAVE PATERNAL LIFE (and thus RESOLVE FAMILIAL RIFT. But it's not a safe treatment, so McCoy is reticent because of a resulting RISK TO SUBHERO. Unfortunately, before Spock and McCoy can act to SAVE SAREK, B PLOT intervenes again, as an assailant knifes and nearly kills Captain Kirk (FATHER OF THE ENTERPRISE). With Kirk NEAR DEATH from a knife wound, ACT 3, Scene 1, opens with Spock refusing to relinquish command to SUBORDINATE OFFICER because of OBLIGATION OF DUTY to the Enterprise. Here we see that B PLOT and C PLOT intertwine, circumstances of both forcing related action. By Scene 2, the story transitions to B PLOT as Spock leaves to interrogate the Kirk's assailant, an Andorian aide, held in the Enterprise brig. The interrogation leads nowhere. With Sarek's health deteriorating, and Spock busy running the ship, in Scene 3, his mother Amanda, attempts to GUILT TRIP Spock into giving up command to save Sarek by threatening a NEW FAMILIAL BREACH - if Spock does not try to save his father, he'll lose his mother. Yet Spock is unmoved. It's only in Scene 4, when Kirk awakes after treatment, that a resolution to Spock's dilemma is introduced. Kirk, in GREAT PAIN, takes command showing GREAT HEROISM, freeing Spock from POTENTIAL PATRICIDE. With Kirk again at the helm, the MYSTERY SIGNAL transmits again and is discovered to come from the prisoner and Kirk's assailant. Kirk sends GUARDS to investigate, who find a HIDDEN TRANSCEIVER. Then, the MYSTERY SHIP begins SUICIDE RUNS, attacking the Enterprise. Thus, antagonists from B PLOT surface to force a FINAL CONFRONTATION across Scenes 6 and 7 of ACT 3, which bleeds into Scene 1 of ACT 4. Across this FINAL CONFRONTATION, the RULE OF THREE applies again. 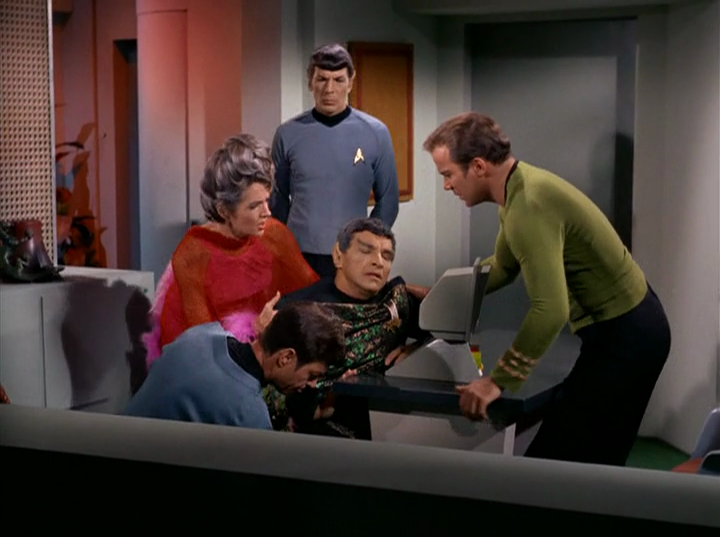 For each attack run, the scenes intercut from Kirk on the bridge to McCoy in sick bay as he performs surgery on Sarek using Spock's LIFE SAVING BLOOD. Each attack increases suspense by ESCALATING RISK, first a demonstration, then loss of ship power, and finally Sarek's HEART STOPS, leading to almost CERTAIN DEATH. But by QUICK THINKING, McCoy uses OBSOLETE TECHNOLOGY to restart Sarek's heart. This is intercut with just as Kirk, using a CRAFTY BLUFF, to pretend that the Enterprise is seriously damaged. Kirk baits the MYSTERY SHIP FOE into coming in for a slow FINAL KILL. But, exposed to the Enterprise's WEAPONS, Kirk damages the ENEMY FOE just as McCoy SAVES A LIFE. And thus both B PLOT and C PLOT are resolved with a THRILLING SIMULTANEOUS CLIMAX. In a curious backhanded almost 'breaking the 4th wall' wink to the audience, McCoy gloats at 'having the last word', whereupon ACT 4 ends and CREDITS ROLL. This also references the beginning of PROLOG, where McCoy opened the story complaining about the stuffiness of having to wear formal regalia. By the end, McCoy is at home in his sick bay, wearing standard dress, and entirely in control. Below is a somewhat poorly done chart, drawn by hand, depicting story timeline, split by act numbers, scene numbers, plot threads, and per scene emotional charge. It's probably a little inaccurate. At least you don't have to wear a tie, dude. NOTE: VOICEOVER EXPOSITION ' CAPTAIN'S LOG' BLEEDS INTO FADE IN AS KIRK PROCEEDS WITH SAREK ON A TOUR OF THE SHIP. SAREK’S WIFE FOLLOWS BEHIND. French Scene: subscene for A PLOT in Scene 2 with Spock's kin family and ship family all present . CUT TO: INT. MAIN ENTERPRISE BRIDGE - OVERLOOKING VIEWSCREEN. Actor Mark Leonard as Vulcan Sarek emoting microexpression 'exasperation'. Closed eyes, tight face, Mark Leonard emotes 'annoyance' even as his character claims Vulcans don't feel. Kirk derides Sarek's statement as CONVENIENT EXCUSE. NOTE: Sarek’s HEART FAILURE is COINCIDENT with his and Spock’s family conflict and estrangement - a physical symptom metaphorically representing an emotional breach of the heart. This IMPLIES an intertwining of C PLOT and A PLOT. NOTE: Kirk's gaze upon Spock as the scene opens. Spock sees but ignores. Then Kirk forces the issue of his concern for Spock's feelings about events that have transpired, which Spock refuses to recognize by CHANGING THE SUBJECT to matters of official business. Nimoy uses micro facial expressions to depict annoyance at Kirk's intrusion into matters of private life. Spock counters UNACCEPTABLE CONSEQUENCE: then Sarek will die - / Amanda shows fear of POTENTIAL OUTCOME. NOTE: KIRK'S RIDICULOUS WWE MOVE. NOTE: a core aspect of the comic element is that Spock and Sarek appear to be insulting Sarek's wife and Spock's mother Amanda for her emotional outburst. It seems a typical 'wife joke'. But, given the context of the resolution of a longstanding father-son family breach, the joke inverts a straight man / wacky nut dynamic, as the audience understands that Amanda's reaction is reasonable given the circumstances while Spock's and Sarek's represent repressed wackiness. By insulting Amanda's supposed irrationality, it is Spock and Sarek who behave irrationally by projecting a false sense of superiority without self-insight.